We the undersigned, through this letter, protest your irresponsible, unethical and unscientific actions. This letter is in concern of making the movie, 300 by your company, which, according to all historical documents, is fraudulent and distorted, and its broadcast guarantees the violation of undeniable international legal rights. It is a proven scholarly fact that the Persian Empire in 480 B.C was the most magnificent and civilized empire. Established by the Cyrus the great, the writer of the first human right declaration, Persians ruled over significant portions of Greater Iran, the east modern Afghanistan and beyond into central Asia; in the north and west all of Asia Minor (modern Turkey), the upper Balkans peninsula (Thrace), and most of the Black Sea coastal regions; in the west and southwest the territories of modern Iraq, northern Saudi-Arabia, Jordan, Israel, Lebanon, Syria, all significant population centers of ancient Egypt and as far west as portions of Libya. Having twenty nations under control, encompassing approximately 7.5 million square kilometers, unquestionably the Achaemenid Empire was territorially the largest empire of classical antiquity. Based on the Zoroastrian doctrine, it was the strong emphasis on honesty and integrity that gave the ancient Persians credibility to rule the world, even in the eyes of the people belonging to the conquered nations (Herodotus, mid 5th century B.C). Truth for the sake of truth, was the universal motto and the very core of the Persian culture that was followed not only by the great kings, but even the ordinary Persians made it a point to adhere to this code of conduct. We did not expect Warner Bros. Picture company, as one of the world's largest producers of film and television entertainment to ignore the proven obvious historical facts, and damage its own reputation by showing the Persian army at the battle of Thermopylae as some monstrous savages, and thus create an atmosphere of public mistrust in its content, and hurt the national pride of the millions of Persians while doing so. While announcing our disgust at such a heresy, we demand an immediate historical review and quick apology from the responsible people. 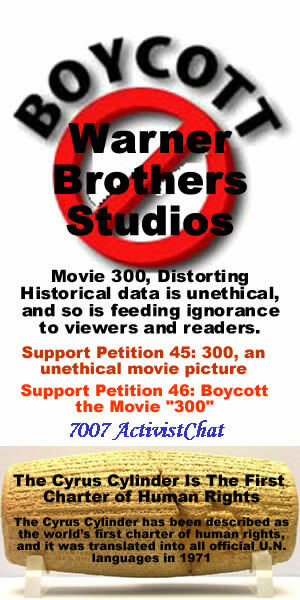 Posted: Wed Mar 07, 2007 4:36 pm Post subject: Petition 46: Boycott the Movie "300"
Petition 46: Boycott the Movie "300"
Your new movie called �300� opening on March 9th in theatres all over the United States and based on a graphic novel by Frank Miller portrays the battle of Thermopylae in which King Leonidas and 300 Spartans fight against Xerxes and his Persian army. Upon seeing the previews of this movie, it immediately becomes apparent that apart from the actual names used in it, the entire depiction of this battle is based upon fantasy. Nowhere among the historical data that remains of the time of Xerxes and ancient Persian empires, do we come across any reference that shows those kings and soldiers as monsters with body-piercing, armors, facial features and demonic behavior that seem to have sprung out from the dungeons of hell. The inaccurate and derogatory depiction of ancient Persians that according to all historical data conducted warfare with mastery and dignity, and looked nothing like science-fictional monsters, is a depiction of how movie studios and authors sacrifice historical accuracy for would-be profits. The author Frank Miller and Warner Brothers Studios should understand that distorting historical data is unethical, and so is feeding ignorance to viewers and readers. Fantasy-like characters should not have names that are based on actual historical figures. Xerxes was one of the many revered and respected rulers of an ancient civilization the vestiges of which last to this day and are acknowledged by historians of all nations. He did not look like a creature out of a frightening bedtime story. Neither did his soldiers. By all means depict important historical events, but take the trouble to visit a library and to do some research before you do so. We, The Undersigned, consider the movie �300� an outrage and boycott it. I would like to appoint Dr. Dadkhah as my attorney in this class action, seeking the permanent stoppage of the construction of Sivand Dam. This is the second petition in support of Adnan Hassanpour and Hiwar Boutimar. The Text has been amended in an effort to improve the ease of read in English. We would like to thank all of you who signed the original and ask you to kindly revisit the petition and continue your support by signing this amended text. 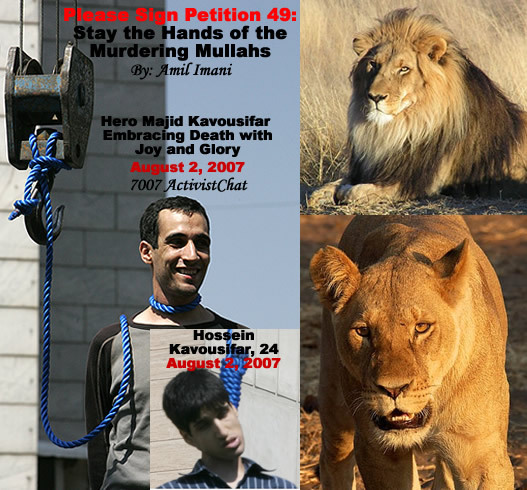 This petition is in protest to the death sentences issued to Adnan Hassanpour and Abdolvahed (Hiwa) Boutimar on 17 July 2007 by the Revolutionary Courts in Iran. 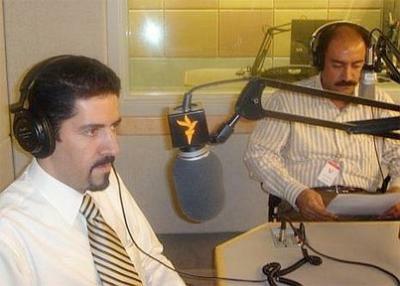 Adnan Hassanpour, an Iranian Kurdish journalist and a member of the editorial board for the banned weekly magazine Assu (banned in August 2005), was arrested and detained on 25 January 2007 without charge. He was held incommunicado and subjected to ill treatment and torture. Hiwa Boutimar, an Iranian Kurdish civil rights activist and a founding member of an environmental NGO in Mariwan, was arrested on 17 December 2006. He, too, was held incommunicado and subjected to ill treatment and torture. Both men were sentenced to death on 17 July 2007 on trumped up charge of Moharebeh (Enmity with God). The Islamic Republic remains signatory to the International Covenant on Civil and Political Rights (ICCPR) and bound by its articles. As such, it is legally bound to protect freedom of expression, assembly and equality before the law, and prohibit arbitrary detention, such as detention resulting from the exercise of one of these rights. It must also guarantee due process and humane treatment to those in detention. Therefore, the death sentences are in direct violations of Islamic Republic's international obligations. Join us in condemning these outrageous sentences and demanding the immediate and unconditional release of these two men. The life that God gives, no man should extinguish. The blood-thirsty mullahs presently ruling Iran blatantly violate this sacred covenant by executing large numbers of people ranging from petty criminals to political opponents. The mullahs and their mercenaries are wasting precious human life to maintain themselves in power through terrorizing the population. Mass public hangings, as well as secret executions in prisons, are routine in the tyrannical Islamic Republic of Iran. Recently Majid Kavousifar, 28, and his nephew, Hossein Kavousifar, 24, were hanged for the alleged murder of a hard-line judge, Hassan Moghaddas, a mullah-judge notorious for jailing and condemning to death political dissidents. The victims were hanged from cranes and hoisted high above one of Tehran�s busiest thoroughfares. This �judge� had repeatedly bragged publicly that he often issued a death verdict without even examining the charges against the individual. The Islamic Republic of Iran has the dubious distinction of executing more children, those under the age of 18, than any other country in the world. Such is the plight of the Iranian people. Robert Tait of The Observer reported on August 19, 2007 from Tehran that �Iran Hangs 30 Over �US Plots.�� Accusing political dissidents as being agents of the U.S. and hanging them without even a semblance of due process is a heinous crime that every descent human being should do all he/she can to end. �Injustice anywhere is threat to justice everywhere,� Dr. Martin Luther King, Jr. warned us. Silence, complacency and indifference invariably play into the hands and schemes of tyrants. History is replete with cases of tyranny gathering momentum in the face of inaction by others, spreading far and wide and visiting great catastrophes on people. It is imperative that we do all we can, as individuals, organizations, and governments to stay the hands of the murdering mullahs in Iran, before their thirst for blood leads their campaign of oppression and death to the four corners of the globe. * Immediate disbanding of capital punishment in the Islamic Republic of Iran and wherever else in the world this inhuman act is practiced. * No summary judgments to be made about any accused without thorough and open trials with the fundamental assumption of innocence until proven otherwise. * The authorities who issue death warrants of others must be held accountable for their actions. The Unarmed defenseless Iranian people are not forgetting these kind of savagery executions, and images by Revolutionary Guards of Mafia Mullahs �. The Iranian people will not cry for these Mad Revolutionary Guards in the above video clip �. When the American bombs are dropping on them and they are looking for holes to hide and asking for forgiveness from Iranian people�.. The Mad Revolutionary Guards in the above video clip have broken all the bridges behind them, even their own family might go after them �. The history will be the judge�. The people of Iran neither have a government or ruler, nor a parliament or a judiciary system! The people of Iran consider the Islamic Republic as the plunderer of their Rights! The people of Iran denounce and condemn any international negotiation or signed agreement between the Islamic Republic and ANY government, institution or establishment and consider these as blatant violation of their property and integrity! � Since clenching the power in 1979, the Islamic Republic of Iran has plundered, looted and wasted all the national wealth of the Iranian people in the form of its natural resources and other means such as factories, workshops, agriculture and other established industries. � The Islamic Republic of Iran has the legacy of in excess of 100,000 executions of its own freedom and peace loving people during its morbid existence. � The Islamic Republic has vanquished and assassinated the opposition parties, organisations and individuals including the country�s best scholars, politicians, journalists, intellectuals and artists as well as students and other academic individuals. These have even taken place beyond the domestic borders and have been carried out within the international boundaries. � The Islamic Republic has cultivated Socio-Economic chaos and crises in Iran and is the sole cause of the highest levels of poverty, unemployment, astronomical levels of inflation, drug abuse, prostitution, bribery, lawlessness, terror and other crimes induced by the regime�s economic, political and social policies. � Every day, ordinary and freedom loving individuals are arrested and tortured in the dungeons of the Islamic Republic for demanding their BASIC HUMAN RIGHTS. The public executions and hangings have soared in the recent years and have taken new alarming levels. � The Islamic republic is steering the country into another unwanted war and confrontation with the Western and the civilised world in order to spread its Clero-Fascist ideology and Islamic territorial expansionism and is threatening the world with a nuclear holocaust! ENOUGH IS ENOUGH! Stop supporting the Islamic Republic Regime! Stop the policy of appeasement! 2- The people of Iran are the rightful owners of their country�s wealth and natural resources. Any agreement, contract, covenant or settlement reached and signed between the Islamic Republic of Iran and ANY of the above mentioned bodies will be treated as ILLEGAL and VOID. 3- The people of Iran treat such agreements and treaties as the blatant violation of their property and shall NOT honour ANY of their contents in the aftermath of the downfall of the Islamic Republic Regime. 4- ALL the clerical and non-clerical leaders and those accomplices serving for the protraction and the survival of this regime must be put on trial and brought to justice in an open International Court of Law for their crimes against humanity. 5- The so called �Economic Sanctions� imposed on Iran have no effect other than continuing the same economic relationships behind the scenes at more cost to the Iranian people and hence, inflicting more misery on the everyday life of the ordinary Iranian people. The political sanctions such as closing down the embassies and consular sections, banning of any State�s visits of ANY Iranian regime�s representative and in general, ceasing any economic-political engagement or relationship and cutting all diplomatic ties with the Islamic Republic regime is the only honourable and dignified response to the Islamic Republic of Iran by the free and the civilised world. The The people of Iran DONOT recognise the Islamic Republic as their legitimate or rightful government or representative Petition to The whole world! was created by and written by Sayeh Sirjani and Dariosh Afshar (dariosh.kabir@yahoo.com). This petition is hosted here at www.PetitionOnline.com as a public service. There is no endorsement of this petition, express or implied, by Artifice, Inc. or our sponsors. For technical support please use our simple Petition Help form. مردم ایران ، جمهوری اسلامی را غارتگرِ حق خویش می دانند. از اینرو انعقاد هر قرارداد و مذاکره بر سر هر حق و امتیازی که ذینفع مردم ایران اند، جز دزدی آشکار بین المللی و نقض حقوق قراردادها نمی باشد. مردم ایران به عنوان صاحب اصلی حق، هشدارِ عدم تعهد و فسخ اینگونه اقدامات را اعلام می دارند. We the undersigned, people of Iran and Iran lovers, would like to formally request you to rise to the challenge and take up the leadership of the people of Iran's movement for setting up a secular and democratic regime and to save our beloved homeland from further destruction and point of no return from the abyss that is awaiting her. In most of your speeches and in your writings you have repeatedly mentioned that your ultimate goal is to see a democratic Iran, the country of your esteemed father and grandfather. Iran is blessed with great many tribes, languages, colours and political ideologies. However who can deny that our country is now drowning in poverty, drugs, prostitution, religious dictatorship, bankruptcy, severe social injustice and international isolation. There is also a grave danger of Iran being attacked militarily by outside forces and / or being split up into several smaller nations. It is in such dark days, that all Iran lovers must accept the responsibilities handed over to them by their forefathers and rise to the occasion to free their country. Some of your supporters, and indeed many others may not be keen on parliamentary monarchy but believe in your sense of justice and democracy. Iranians have waited long enough for you to rise and lead them back to freedom, democracy and prosperity. What ever the reasons may be for your reluctance to take the leadership role to unite the opposition, we simply urge you to please reconsider because in light of the dangers that are facing Iran today, we need you to lead the way and stand as the unifying force for the opposition. For the vast majority of the people the current situation in Iran is intolerable. Before Iran is attacked and pushed back into the dark ages or fragmented into different states we request you, not as the leader of the monarchists or Shah of Iran but as a liberal thinker Iranian and one who is known and respected by many countries in the world to make a declaration and call all forces interested in a free, secular and democratic Iran to unite under one flag and make a push to free our beloved country. ما امضا کنندگان نامه زیر که از میان ملت میهن دوست ایران برخاسته ایم ، رسما از شما درخواست کوشش هر چه بیشتر در پذیرش رهبری ملت ایران، برای رهایی از چالشی که در پیش رویشان قرار گرفته است می کنیم. رسالت بزرگ شما رهبری و هدایت ملت ایران بسوی مردم سالاری و جدائی دین از سیاست است. رسالتی که میهن را از تخریب و ویرانی بیشتر نجات داده و از گذار به نقطه غیر قابل بازگشت بسوی پرتگاهی که در پیش روی ملت ایران است، مصون دارد. جنابعالی بارها در سخنرانی ها و نوشته ها یتان فرموده اید که هدف اصلی شما رساندن ایران به آزادی، مردم سالاری و ادای دین به میهنی است که آب و خاک پیش� کسوتان و خاندانتان بشمار می آید. از ویژه گیهای میهن ما ، برخورداری از گوناگونی فرهنگی و نژادی ، گفتاری و آرمان های سیاسی است. اگرچه امروز بر هیچ کس پوشیده نیست که کشور ما در دام منجلاب فقر و فساد ، اعتیاد ، روسپی گری ، دیکتاتوری مذهبی ، بی عدالتی اجتماعی و انزوای جهانی گرفتار آمده است. بدیهی است در چنین مقطع شومی که کشور ما درخطر یورش بیگانه گان و تجزیه طلبان قرار گرفته ، وظیفه هر ایران دوستی است تا رسالتی را که نیاکانش به او واگذار کرده اند را ارج نهاده و با تدبیر و تلاش در این راه مهم گام بردارد تا میهن خویش را از خطر بزرگی که گریبان گیرش شده است، برهاند. شاید برخی از هواخواهان و دوست داران شما ، اعتقادی به نظام پادشاهی و یا مشروطه نداشته باشند. اما ، باوری عمیق به هدف شما جهت سوق دادن ایران به سوی آزادی، مردم سالاری ، رفاه و عدالت اجتماعی دارند. ایرانیان به اندازه کافی صبر کرده اند و در این زمان وظیفه تاریخی جنابعالی است که آنان را بسوی آزادی، مردم سالاری و رفاه اجتماعی هدایت نمائید. هردلیلی که باعث خود داری شما از پذیرش هدایت مردم جهت یکپارچگی در راه آزادی و رهائی ایران شده است ، ما خواستار بازنگری شما در تصمیم خود می باشیم . با در نظر گرفتن خطرات بزرگی که گریبان گیر میهن ماست ، ملت ایران به حضور شما به عنوان راهنما و عامل یکپارچگی اقشار مردم نیازمند است . برای بیشتر مردم ایران ادامه شرایط و وضیعت کنونی تحمل ناپذیر است ، بیش از این که میهن مان مورد یورش بیگانه گان و یا تجزیه گرایان قرار گیرد و یا سیر قهقرائی را به سوی دوران تاریکی بپماید ، از شما نه به عنوان یک پادشاه و رهبر فراکسیون پادشاهی ، بلکه به عنوان یک ایرانی آزاده و روشنفکر و فردی که مورد احترام سیاستمداران ملل دنیاست ، درخواست می کنیم فراخوانی به تمامی ایرانیان آزاده ، سکولار و مردم سالار ارائه نمائید ، تا همه آنان زیر یک پرچم گرد آمده و کشور عزیزمان را به آزادی برسانند. - wearing or carrying all religious symbols, such as Islamic hijab, in schools should be prohibited. We, the undersigned, unequivocally condemn the threats of death and bombings by Islamists to limit, censor and silence any critique of Islam. Criticism of religion - any religion - including caricaturing religious figures, however offensive, are integral components of unconditional freedom of expression, secularism, and the separation of religion's intervention in the public sphere. These are rights fought for and gained by the enlightenment and progressive social movements. We must not allow anyone or any movement to erode these fundamental rights and values. *Immediately prosecute all those issuing threats against persons and places, e.g. threats to kill, or carry out suicide bombings. The Defend Free Speech and Secularism Petition to the International Community was created by and written by Maryam Namazie (m.namazie@ukonline.co.uk). This petition is hosted here at www.PetitionOnline.com as a public service. There is no endorsement of this petition, express or implied, by Artifice, Inc. or our sponsors. For technical support please use our simple Petition Help form. We, the undersigned, through this letter, protest your irresponsible, unscientific actions, and demand an immediate and unconditional deletion of �Arabian Gulf� from Google Earth. Arbitrarily designating the Persian Gulf as the Arabian Gulf is an irresponsible violation of all historical and International standards and would undermine the integrity of Google Earth. For the records, the name Persia has always been used to describe the nation of Iran, its people, and its ancient empires since 600 BC. It is derived from the ancient Greek name for Iran's maritime province, called Fars or Pars in modern Persian, Pars in Middle Persian and P�rsa in Old Persian, a word meaning "above reproach.� Persis is the Hellenized form of Pars, and through the Latinized word Persia, the other European nations came to use this word for the region. This area was the core of the original Persian Empire. Since ancient times almost all foreigners referred to the entire country as Persia until March 21, 1935, when Reza Shah Pahlavi formally asked the international community to call the country Iran � a name that the people of Persia, themselves, used to refer to their country since the Sassanian period. "Iran" means "Land of Aryans". In 1959 some Persian scholars protested to the government that the name change had separated the country from its ancient civilization. Therefore, the late King Mohammad Reza Shah Pahlavi announced that both Persia and Iran can be used in Western languages. Without disparaging the Arabs, Iranians are proud of their non-Arab heritage and strongly resent any attempt at denigrating or changing any aspect of their Iranian heritage. And the Persian Gulf occupies a pivotal place in the Iranian history and culture. Furthermore, Iran abuts the Persian Gulf for 2,000 Km, while about a dozen recently-created Arab Sheikhdoms and emirates border the Gulf on the other side. The historical and geographical name of the Persian Gulf has been endorsed and clarified by the United Nations on many occasions and is in use by the UN, its member states, and all other international agencies worldwide. The last UN Directive confirming the name of the Persian Gulf was (reference ST/CS/SER.A/29/Add.2) on August, 18th 1994. 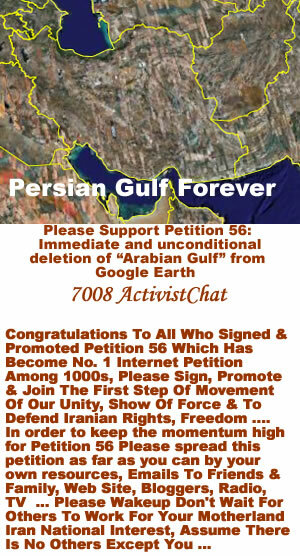 The worldwide Iranian people are deeply affronted by this arrogant designation of �The Arabian Gulf.� We demand, in the strongest possible terms, that you take immediate steps to restore the rightful name of the Persian Gulf to the waterway on Google Earth and delete any other arbitrary name. We hope that this notice would suffice and obviates the need for litigation. Arash and Kamiar Alaei are two dedicated Iranian physicians whose lives and activities have been dedicated to honoring Iran. They have been focusing since several years in drawing the attention of Iranian health care system to HIV/AIDS. They have championed triangular education, prevention, treatment, and support clinics in Iran for HIV/AIDS. I have heard them talk during their tour of US on how they started their efforts against HIV/AIDS in Iran at the city of Kermanshah and succeeded in have the health care system in Iran to pay attention to this disease. They are truly fantastic. Understanding the importance of fighting this disease and the global nature of it, they have made major efforts in educating health care professionals in neighboring countries of Iran on HIV/AIDS. They have been detained by the Iranian government with no explanation since June. Physicians for Human Rights have created a petition calling for their release. Please follow the link below to sign the petition for their release. - The value of a woman's life is one half of the life of a man. - Daughters get half the inheritance the sons get. - A man can divorce his wife any time he wishes and without her knowledge. - Men are allowed to marry four wives and as many wives as they can buy. - Women can not travel, work, go to school, or even leave the house without their husband's permission. - A woman must live where her husband decides. - Mothers do not get the custody of their children when their husbands divorce them. - Husbands can take the baby away from the mother and have another woman feed and raise the infant. - A widow does not get the custody of her children after the death of her husband. The children will be given to the paternal grand parents of relatives, and the mother has no right of visitation. - If the husband has no family, the community clergy takes the custody of the woman's children including the family money and belongings. - In the case of a man's death, the wife will be left without her children, home and property. - In the case of inheritance for the old wife, mother of grown children, she gets one eighth of the value of the building of the house, not the land that the house is sitting on. - Marriage between a Muslim woman and a non-Muslim man is forbidden and invalid, while a Muslim man can marry a non-Muslim woman. - Muslim men are allowed to beat their wives to discipline them. Do we want to allow the application of this harsh class of citizenship on our current liberal democratic system? If a family Sharia law would be recognized by our legislative body wouldn't that negate the principal of our current human rights? We hereby ask members of the US Congress to takes steps through resolutions or laws that would prevent Sharia and Sharia practices from becoming official US legal provisions anywhere in the United States. The Stop Sharia from becoming official in the United States Petition to U.S. Congress was created by and written by Dr. Wafa Sultan M.D. (wafasultan2008@gmail.com).